The Order of Lepanto’s “system” is two-fold. First, for historical fencing we combine academic scholarship, vigorous physical practice, and insightful effort. Second, our group also dedicates academic study, practice in spiritual exercises from multiple disciplines, and teamwork to address aspects of spiritual warfare and faith. To achieve progress in research and training we form into Study Groups of like-minded men who work together and share informati on under the same core approach and methodology, and with the same philosophy, goals, and shared values. We develop a historically sound and martially effective practice for reconstructing martial skills based on the source teachings of diverse historical works then offer it to members as a training program. We strive to increase our practice of faith and our spiritual leadership in our families and communities. We define standards and then certify our member practitioners and instructors in these skills. Our study approach consists simply of: researching historical European fighting manuals, historical and modern spiritual exercises, literature and iconography combined with comparative analysis from hands-on experience using accurate replica weapons, armor, and sacramentals. As for martial arts, the real historical teachings and arms are our guide. We neither make it up on our own nor simply “borrow” from popular Asian martial arts or modern sport fencing. Our own historical sources are too rich, diverse, and sophisticated in their methods to need to bother. We will, however, point out where differing styles overlap for the sake of knowledge. In the area of spirituality, we study authentic Catholic sources who are true to the Magesterium of the Church. Our church has a long, rich history and we no more “borrow” from other faiths than we “borrow” from other martial arts traditions. The Training Methodology consists of physical practice using several training tools for a well-rounded comprehensive understanding: blunt practice blades, wooden wasters, and sharp reproduction weapons. These are employed in exercises, drills, and practice routines. While continually revising our core assumptions of historical fencing, members constantly innovate, experiment, and self-critique our study curriculum. That’s why it produces demonstrable results and maintains the cutting edge. As an Art of fighting, not merely historical swordplay but a fighting art, it connects offensive and defensive actions as it teaches the simplicity of leverage and timing, motion and striking, displacements, and seizures. These skills are then transferred to the arena of spiritual warfare, where knowing them allows the student to be better prepared for the spiritual battles that confront Catholics and all Christians in our post-Modern society. The ability to stand face to face and spar a skilled opponent with a sword will enable the true masculine spirit to be able to stand and defend the family and the faith from spiritual attacks. These Renaissance fencing skills are not a fantasy sport, dueling game, or role-playing amusement but a modern combative discipline. This is no “dog and pony” approach, and no pretentious play and display attitude. The curriculum is aimed at understanding, as much as possible, the forgotten fighting skills of both the sword and the spirit, and not just emphasizing a single isolated source or master’s work. We seek to do cross-comparisons among the historical teachings and not synthesize a method from them, not recombine it into something new, but instead attempt a distillation of their teachings—in the sense of obtaining a purity of information, not diluted with conceptions and assumptions. It is a holistic approach to research and study for martial and spiritual aspects of life. In this approach to exploring lost fighting arts we first look for commonalities in the source literature; seeking understanding of underlying elements in order to learn about the overall nature of the craft. Then we next begin to focus on specific sources or teachings noting their unique aspects, looking for any contrasts in style or philosophy from others. We address the spiritual part in a similar fashion. Studying and comparing different expressions of authentic Catholic spirituality to distill their underlying commonalities while learning to appreciate their uniqueness. Being a Knight in The Order of Lepanto means a commitment of study, exploration, questioning and examination. While also executing prayers, movements, and actions with vigor, then repeating them, and analyzing the results. 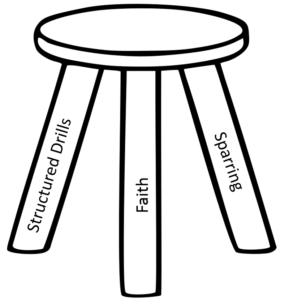 This system is our tool and allows students to teach themselves by using materials from the source manuals as examples and as “puzzles” to work through, always keeping in mind either the lethality and intent of the historical techniques, or the intent of spiritual exercises in growing closer to God. This method works to produce quality martial arts fighters and men who are more ready to engage in the spiritual battles that confront us daily. We actively seek to avoid producing students that are technically proficient in movement patterns yet tactically ineffectual as fighters. We seek the meaning of these teachings with an eye towards creating a modern way to safely practice them once again. We stress these skills because Satan and evil spirits are more tactically creative than human opponents. The Order of Lepanto’s system of exploring real fencing techniques also places emphasis on proper intent – meaning that we learn and execute moves with realistic speed and range in order to acquire a correct sense of counter-timing, balance, and motion. Our group stresses a “martial” approach to both fencing and spiritual combat – by this we mean emphasizing that these fencing skills and techniques were intended to be used with force to cause injury (though we never use them for this) and the spiritual warfare techniques were meant to be used actively in all aspects of one’s life. To be relearned properly today it is only logical that they must be performed in earnest, with energy (and for fencing – speed), and we must make the effort to practice them in this way. Going slow and soft beyond what is initially needed for learning a technique, only teaches you to go slow and soft. This kind of dynamic doesn’t come at first and has to be developed over time. The degree to which each student achieves it may vary. While many other organizations may focus more on the pageantry and role-playing of knightly tournaments or on the “deportment” of proper “technical exchanges” within a conception of gentlemanly duels, the Order of Lepanto does not. Although these may be semi-historical approaches, we feel such things are more ritual than martial; and more ritual combats of the period were far outweighed by real fighting. Thus, one of the things we try to inspire in modern students is a realistic appreciation of the martial content of the subject we study. We therefore place value on the mental or psychological aspects as well as the physical or technical. The ethical and moral component of the craft is addressed in a very unique way for the Order of Lepanto – as the only Catholic-based Renaissance Martial Arts group, we are in a perfect position to study and truly understand the moral and spiritual aspects that Knights and other Catholic soldiers valued during these historic times. For both Medieval and Renaissance weapons and sword training what our students normally do is fairly simple yet sophisticated and detailed. Beyond our learned insights, there is nothing “secret” or “special” really, just plenty of hard training, intensive study, and emphasis on free-play using our guidelines. Few things are as useful for fighters as constant free-play for teaching distance, timing, perception, tactics, and for gaining technical proficiency (as well as discovering faulty bio-mechanics). In the Order of Lepanto system for fencing study, sparring is supplemented by group and solo work in delivery of techniques and actions plus moving with proper footwork and stepping. Students work on their focus, speed, control, and power in their attacks by performing striking and counter-striking drills with a partner. A main practice we employ using floryshes (or solo “routines”), a series of basic moves and performed in semi-sequence, but not as any prearranged set pattern or programmed “dance” to practice fundamental form and the flow of movements. Over time, intent (range, speed and power) is increased to more and more earnest levels. Safe free-play / sparring is conducted with controlled force but with realistic martial intent (speed and contact) using wooden wasters or blunt training blades. Sharps are used for some occasional cutting experience. The historical teachings tell us many things. But they do not specifically instruct how one goes about doing these things correctly, let alone learn or teach them. This then is where experience and insight comes into the process of reconstructive interpretation. Today, practicing historical European fighting arts and swordsmanship is about reconstructing real techniques as real methods. However, it is not possible to fully know or completely reproduce the precise methods of any particular historical styles. It can also be a temptation to blindly speculate or merely invent hollow theories to fill in our knowledge gaps. So, to assist in advancing and promoting a more systematic and structured instruction in the ideas, techniques, and systems of the historical Masters of Defense, as well as the varied skills involved in spiritual warfare the Order of Lepanto offers a proficiency program for these combat skills. To make it easier for enthusiasts to learn a true craft we also present a core curricula as well as continually developing sound instructional methods for transferring and testing of skills. The simple training objective is to provide greater legitimacy in both teaching and evaluating fighting skill with historical arms and growth in the spiritual life. We have always endeavored to avoid both the “museum curator” approach to historical fencing and the “casual Catholic” approach to our faith. We treat them as neither distractions, fantasies, nor a fossilized cultural artifact instead of a hands-on, and hearts-in craft. We also strive to avoid a “synthetic art” as we synthesize our understanding of the teachings of the many historical and spiritual source works which are our direct guides. We encourage and promote study of the historical fencing manuals and spiritual writings combined with the sharing of insights as well as discourse, healthy debate, and peer review. Many of the other historical fencing groups remove the religious aspects of the art – to attempt to distill the physical actions only in order to make it more acceptable to a secular society. The Order of Lepanto has chosen a more holistic approach to the study of these teachings – one that combines the truest physical methods that we can reconstruct with the Catholic faith that these men also practiced. The Order of Lepanto holds that the best way to communicate authority in an interpretation of martial skills is not merely theorizing, but by proving those theories through their energetic application, as the original practitioners would have done. Likewise, we not only study the medieval mindset as it applies to faith, but work to earnestly build our prayer life, practice spiritual leadership of our families, and prepare for energetic engagement in spiritual warfare. During the Medieval and Renaissance periods, it was of utmost importance to understand and practice martial techniques with a strong emphasis on personal protection. It was a real possibility that those living during these times would be subject to being attacked with deadly speed and force during the course of their lives. Therefore, the best way to communicate authority in interpretations of these methods and techniques is through energetically displaying competence in their physical application and doing so in a manner that demonstrates their martial validity. Furthermore, the religious mindset which was held by these people was vastly different than we typically experience in our modern culture. However different, these men held the essence of same faith we profess today. By learning how they connected with the physical and spiritual, we can learn great lessons about leading our families and parishes. Since self-defense methods would invariably be exercised at full speed and with deadly intent, we must prove that our reconstructed methods would work under similar conditions and not only in slow-motion progressions. A slow-speed activity, where you play out a preprogrammed series of moves, does not prove the effectiveness of any method of self-defense. We must move with deliberate caution and appropriate control – especially when dealing with new techniques, new students, or practicing with novices. However, at some point our goal must be the ability to execute the actions with the intent to truly defend. These goals also relate directly to our spiritual journey. We need to practice in our prayer lives and build that connection to God before we will be ready to execute any true spiritual combat. Providing a broad general understanding of fighting arts from the Medieval and Renaissance periods is a core goal of our group. As such, we include in our research all European fighting manuals up to the late 17th century. As a result of this broad exposure, students realize a benefit in an ability to quickly integrate new information into training and teaching curriculum. In our studies of the faith, we do not expressly limit the texts to these time periods, but we do emphasize them as primary sources to build true understanding of the spirituality that the Knights of old believed and practiced. While preprogrammed prayers and arranged martial arts drills form an underlying basis for spiritual and physical warfare, the ultimate understanding of the of these fighting methods cannot be accomplished without transcending these basics. To explore and reconstruct these historical martial teachings and methods requires developing skill in performing them spontaneously through sparring conducted with proper intent and energy. The craft cannot credibly be pursued when it is reduced to a mere sport. Sparring is about creating a safe and realistic practice fight in order to learn the application of the methods taught under adversarial conditions. It is primarily used for the purpose of combat preparation. In the adversarial context, the martial artist receives vital feedback and builds camaraderie with fellow practitioners – not to mention, having fun too. However, recreational and amusement was not the original goal of the activity, and neither is it ours. Nor was it merely executing some ideal technical form or some personal aesthetic, the form comes from the motion of effective function. In real life-and-death encounters effective techniques by their nature require good form. They don’t require restrictions for safety, as in classroom practice, or rules for scoring as in sporting contests. Some would dismiss sparring as a vital tool for learning martial arts and these people will notoriously perform the poorest when actually engaging in it, or the least physically capable. Instead, they would advocate a practice that consists of arranged drills (sometimes called “katas”) and seldom demonstrate anything more. Unfortunately, this idea does not prominently appear within the source teachings or historical accounts of Renaissance martial arts. The common sense truth that if you cannot perform well under mock conditions, you cannot claim you would do better if only the conditions were real. As in many other aspects of martial arts and spiritual warfare, the same holds true here – practicing prayers without contemplating their depth and power will leave one simply reciting memorized passages without much of the benefit that deep belief will bring. The evidence in undeniable that assorted forms of mock combat practice as a means of training knights and ordinary fighting men in the Medieval and Renaissance eras were used. Therefore, the required physicality of doing so is also credibly is self-evident. For serious students of the craft there is simply no ignoring this.